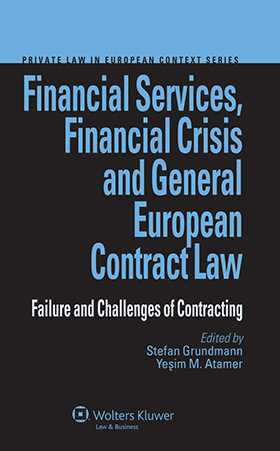 The authors analyse the full body of second generation European Banking Contract Law and show convincingly that the world financial crisis has proceeded at least as much from contracting as from corporate governance. This vantage point promises to open new ways to approach this most crucial of contemporary problems, and will be of great interest to all professionals examining the role played by financial services in market crises. This book is based on the tenth annual conference of the Society of European Contract Law (SECOLA) which took place in Istanbul in June 2010. Chapter 2 Policy Responses to Credit Crises: Does the Law of Contract Provide an Answer? Chapter 3 A Need for Contract Governance? Chapter 4 Consumer Rights Directive or a General European Contract Law? Chapter 7 Duty of Responsible Lending: Should the European Union Take Action? Chapter 9 Full Harmonization of Retail Financial Services Contract Law in Europe: A Success or a Failure? Chapter 13 Contribution of the European Ombudsman to Limiting Late Payment by the European Commission.